Sorry . . . not much else to get excited about this week! CVS March Monthly Deal: Stayfree Money Maker! Hurry! Hurry! This deal ends today . . .
Buy one package for $3.99 and get a $2 Extra Care Buck (limit of 4 per card)! Two FREE My Little Pony Toys!!! If your little one likes My Little Ponies this is a great deal just in time for Easter. Toys'R'Us sent an email advertisiting that My Little Pony is Buy 1 Get 1 FREE today, Wednesday March 31st. Combine that with this B1G1 Printable Coupon from Hasbro and you get 2 FREE My Little Pony toys -- just pay tax! I normally post this on Saturday, but as I mentioned I was MIA. So here is the updated giveaway linky for this week. Make sure you check out all the giveaways. Some of them are really cool and some of them end in the next day or two. Krispy Kreme- One doughnut per A, up to 6. McDonald's- If your child has straight A's they can get a free meal. Kindergarten-5th grade receive a happy meal while 6th-12th will receive a value meal. Pizza Hut-For a report card that has 3 A's they will reward your child with one personal pan pizza and a small drink or milk. This offer is only for K-8 and is dine-in only. Chick-Fil-A- Many stores have programs to reward children but they vary by store. Check with yours to see what it offers. Look for "Try Me" tags on Purex Fabric Softener, for a mail-in rebate that makes them FREE! Today, Groupon is offering a $49 photography session with Bludoor Studios in Southlake. Limit 2 per person. May purchase multiple groupons as gifts. Valid for indoor or outdoor studio session only. May use multiple images within chosen package. By appointment only. This isn't as good as the MOPS fundraiser that we do locally, but if you need professional pictures quickly, it is definitely worth it. They regularly do weddings, portraits, senior pictures and newborn photoshoots. If you don't live in the DFW Metroplex, search here for Groupon deals in your area! So, yesterday was the first day in forever that I didn't post anything . . . not even once. But there was a good reason for it. I participated in a community wide consignment sale that raises money for our MOPS group. I was one of the coordinators so I was able to go early Friday night and shop before the crowds. I got some GREAT deals. I bought a like new Chicco high chair for $25! My boys stay in their high chairs forever - at least until the age of 2 - and they're hard on the chairs by then, so while we still had one that would have probably been functional, I'm excited my new little toot will have the chance to tear up his own chair. And that I was able to find such good quality for such a good price. If you signed up for the bTrendie $10 credit I posted about a couple of weeks ago, there are a couple of pretty good deals available today. If you didn't sign up, no worries you can sign up right now and get your $10 credit. The Consumer Product Safety Commission (CPCS) recalls one million Infantino baby slings after suffocation risks are confirmed in some models. According to CPCS, these types of carriers pose a potential suffocation risk to infants under 4 months, those born with low birth weight, born prematurely or those with breathing problems. Those with Infantino slings that are being recalled (sold 2003-2010) can call Infantino at 866-860-1361 to receive a free replacement product. We have a winner . . . #37 - Shirley. I did not see a way to contact you, so you have until midnight tonight to get back to me with your address or I will have to pick another winner. Sears.com is having a HUGE clearance sale in their children's and baby's departments. In the baby section alone are over 700 clearanced items and over 1000 clearanced items in their baby and toddler clothing section. Get 20% off your order at Get Organized via code AFGX0325. The best code we've seen from them this year, it works sitewide with no minimum and even stacks on top of clearance items. For example, the Poop-see Scoop is already reduced up to 85% off, which reduces the price from $19.98 to $4.99. The code then takes it to $4. And the Boxed Wine Cooler, which drops from $49.98 to $19.99 to $15.99. One of the items I thought would be cool for a Father's Day gift was the Weather Station Shower Mirror (shown above). This special mirror made just for the shower prevents the glass from fogging over. In addition, it gives you the day's weather information and has a place for storing all of the necessary elements to shave while in the shower. The price is clearanced from $49.98 to $19.99. Better yet, the code AFGX0325 takes an extra 20% off, cutting it to $15.99. Shipping begins at $4.98 (it is $8.98 for the shower mirror) and there is no sales tax. TODAY ONLY from 3 - 7 p.m. if you test drive a Subaru car at the Market Street in Mckinney, you can get a free $25 gift certificate to Market Street. This is an easy way to make $25 and stretch your grocery budget . . . and who doesn't LOVE Market Street? I talked to the manager at Subaru and he said, you just come in, find the Subaru display, register and take a test drive around the block to get your gift certificate. Sounds super easy! Let us know if you get your's. I think I may be sending my husband when he gets home. For all of you locals, I just wanted to make sure you were aware of the amazing Sweet Repeats sale that will be taking place this Saturday. It is THE place to get nice second hand toys, clothes, and baby equipment. If you're able to go, let us know what you find . . . I'll be back to tell you what I was able to purchase at the pre-sale (for volunteers)! I love Lucky Jeans, but I usually can't afford them. However, today, you can get this pair of skinny jeans by Lucky for only $8.99 plus shipping. Use code AEMARWD to get an extra dollar off and shipping is $7. If you're a Freebirds World Burrito Fan, you'll want to check out the preview party on Monday, March 29 for the new local restaurant off Stacy road in Allen at the Village of Allen. Lunch starts at 12:00 and dinner at 6:00 and for the first 250 fanatic fans they’ll have free burritos, fountain drinks, and more. Here’s a great way to get some new clothes or buy some inexpensive gifts! Add 7 or more items to your cart. Use coupon code 776242406 to get $10 off your order of $25 or more. Choose in-store pickup to get free shipping. GREAT deal - you can go to Lowes.com and find this Shop-Vac 6-Gallon 3.0 peak HP Wet/Dry Shop Vac priced at $19.97 (regular $44.97) until 03/30/10! Even better, you can pick it up in-store for FREE! Father's Day isn't that far away and this would make a wonderful (and functional) gift. FREE Coupon Booklet from Home Made Simple! You may have heard me mention these coupons from Home Made Simple. (If you had them, you could get FREE Dawn dish soap at CVS this week.) I sign up every time they become available because the coupons are great. Go here to sign up for your's! You'll get great coupons on items like Swiffer, Cascade, Febreeze, Dawn and more. Do you scan your CVS card when you walk into the store? You should! EVERY time. The machines are programmed to print coupons for you and they will print different coupons each time you scan until you have printed all of the current coupons. Then they tell you they don't "currently" have any coupons for you. Currently, $1/1 CVS brand shampoo or conditioner coupons are printing out! Most likely, after scanning, you’ll score a $1/1 CVS brand shampoo or conditioner coupon which you can then use to score the full-size shampoo or conditioner FREE! There is a Catalina deal on Ziploc bags that just started - purchase any 3 Ziploc products in one transaction and receive a $2 coupon off your next order. ** Then, submit for the SC Johnson $5 rebate (you can do this rebate three times through July, 2010!) to make this a $4.39 moneymaker! I'm on a bit of a 90% off kick, and I came across this section at Christian Book Distributors. I love them to begin with because they always have great deals on my favorite books, but I can't wait to dive in and see what I can get for this cheap. Everything in this section at CBD is at least 90% off and some is even more! At checkout, use the code NEW8184 to save an extra 10% off at checkout. There is a code on the Swag Bucks toolbar until 3:15 pm CST! If you have the toolbar, look for the drop down box that says TSG. Click on it and there will be a message that contains the code. If you don’t have the toolbar, you can download it here. If you're still notsure what Swag Bucks is or you want to know how to earn more Swag Bucks? Read this post on Swag Bucks. 40% off Joanns (exp. 4/3) Use EED93 for online purchases. Pizza Hut: Special Tuesday Deal! Tuesdays only, you can order two pans of pasta and five breadsticks for just $10! Go here to order your's! FREE Ice Cream at Ben & Jerry's Today! Visit your local Ben and Jerry's today between noon and 8 p.m. to get your free cone. Expect a bit of a wait, but if you have some downtime it's well worth it. Go here to find the location nearest you and more details. Starbucks locations around the country are holding Free Pastry Day. 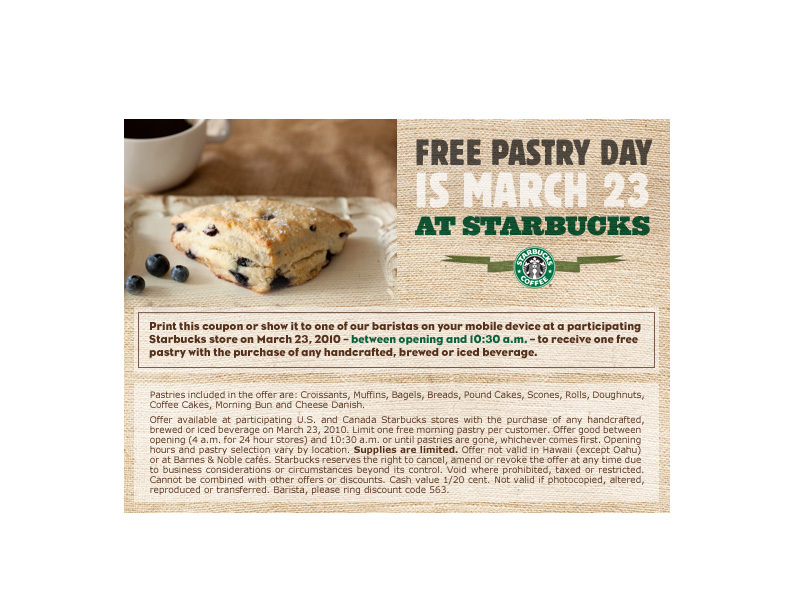 Hurry and stop by before 10:30 a.m. and show them this coupon and you’ll get a free Pastry of your choice when you order a hand-crafted beverage. Crocs is having a great sale again. Their outlet shoes are 50% off plus an additional 20% off and FREE shipping! The Mary Jane style Croc for girls/juniors is only $7.99 including shipping. Take a look and see if there is something you might need for the glorious summer that must be right around the corner! These are really cute batteries for a gift, and if you buy 4 or more you qualify for FREE shipping. Each 4 pack of batteries is on sale for $.99, buy 4 or more get FREE shipping. Find this and other great deals at Graveyard Mall. Random Complaining . . . This is ridiculous . . . I am up past midnight AND so unbelievably tired I feel like I can't keep my eyes open. The problem is when I do close my eyes, I can't sleep. I have heartburn. My legs ache. My muscles twitch. My darling son in utero doesn't want to be still. All this to say, I am generally miserable and would give anything to be sleeping instead of trying to bore myself to sleep. By the way, it's snowing a ridiculous amount right outside the window next to me. And yesterday (actually Friday) it was beautiful in the seventies and we all played outside in short sleeves. Apparently that's Texas weather for you. I hope that you can handle these random tidbits of what I'm thinking because I ahve a feeling there may be a few more in the weeks left before Weston arrives and the weeks just after he gets here! Guess it's time to shut this computer off and at least try to get comfortable enough to sleep. This one is a bit tricky in my opinion. It isn't spelled out like they are sometimes. But if you go to the Polls section of the Swagbucks site, you will see a poll on VHS tapes. Answer the poll and then scroll through the comments until you see one by TSG (The Swagbucks Guy). The part in quotation marks is the code. It's worth 12 Swagbucks. Join Swagbucks today if you haven't yet. This deal was kind of buried in the Albertson's post I put up earlier this week, but I sent Joe to the grocery store with a list of items and coupons. He did GREAT! And this was one deal I wanted to make sure ya'll didn't miss out on. I had a couple of Kellogg's coupons - remember you can use them even on the 3 FREE cereals - and so we paid $10.50 for 7 boxes of cereal and 3 gallons of milk. The best part of it to me was that the free milk comes in the form of coupons so you don't have to drink all three gallons in one week. We got one today and saved the two other coupons for the next week or so. I know you mom's will love this one. Chik-fil-A at Stonebriar Mall is doing a fun giveaway right now. As you shop keep your eye out for a HIDDEN Plush cow! If you spot one, tell the employee at that store "I spot the Chick-fil-A Cow" and receive a coupon for a FREE Chick-Fil-A Chicken Sandwich. Look in these stores: Aeropostale, Apricot Lane, Aveda, Banana republic, The Body Shop, Build-A-Bear, Eddie Bauer, Gap, and Harry & David. It's FREE Cone Day on March 23rd at Ben & Jerry's! You will get a free cone at participating locations from 12 p.m.- 8 p.m.! YUMMY! Click here for details! Maggie Moo’s Ice Cream and Treatery announced an “E-cone-omic” Relief Package for its customers this Tax Day, April 15, 2010. Participating U.S. treateries will give away free slices of its new, one-of-a-kind MaggieMia’s™ Ice Cream Pizza from 3 to 7pm. Click here to find a location near you! Each Saturday, I'm going to post the link to my Giveaway page so you will remember to check out all of the ongoing giveaways listed there . . . including the one for Chicks & Lipstick Boutique's BubbleYum Gum bow! If you haven't entered to win it, go right now. Check out all the giveaways! I got a tip that Kohl's is giving out $10 in Kohl's cash with any children's clothing purchase. If you aren't familar with Kohl's cash it works like a gift certificate but has a limited time that it is valid - usually beginning about a week after you receive it and lasting a couple of weeks. The coolest part is this particular person only spent $1 and received a $10 voucher! That's a great way to get some extra cash to spend on the 80-90% off sales that Kohl's will be running in the next few weeks. Usually I stock up on clothes and gifts for the entire year during this sale. In addition, right now, Kohl's has all spring dresses on sale from 25-40% off through Tuesday, March 23rd. The Kohl's Dress above was $56, now $28. I told you today is the day to earn extra Swagbucks - if you want more, go to the home page and watch the main ads in the center of the page. One of them has the code in all caps and if you read the text under it, you'll know you've found the correct ad. More Printable Coupons here, here and here! For the full breakdown of Walgreen's deals, go here. Don't forget to search, search, search! Today is Mega Swagbucks Day and you can earn double, triple, quadruple what you normally earn. If you haven't signed up, start today! I've already redeemed $25 worth of Amazon giftcards and have $15 more waiting for me to decide what I should buy. You could be reaping the same rewards. This may be a wonderful deal for those of you that need to replace a major appliance anyway - not all appliances are covered but washing machines, dishwashers, and refrigerators are! In April, Texas will offer a rebate program this spring to help residents replace older, inefficient appliances with energy-efficient appliances. The mail-in rebates will apply to eligible appliances purchased between April 16 and April 25. The 10-day period will coincide with the 40th anniversary of Earth Day, April 22.